One of the eye-catching and very information rich visualizations comes from a related Blog post by the “Connectivity, Inclusion, and Inequality Group” called “Uneven Geographies of Digital Wages“. The cartogram depicts each country as a circle and sizes each country according to dollar inflow to each country during March 2013 (on the freelance work oDesk.com platform, rebranded in 2015 to Upwork). The shading of the inner circle indicates the median hourly rate published by digital workers in that country. The graphic broadly reveals that median wages are, perhaps unsurprisingly low in developing countries and are significantly higher in wealthier countries. Another Blog post on the geographies of online work adds several more visualizations (based on 2013 data, so a bit dated by now). For instance, one world map highlights the relationship between supply and demand. It distinguishes between countries with a positive balance of payment (i.e. countries in which more work is sold than bought) and countries with a negative balance of payment (countries in which more work is bought than is sold). The figure more clearly delineates the geography of supply and demand: with much of the world’s demand coming from only a few places in the Global North. 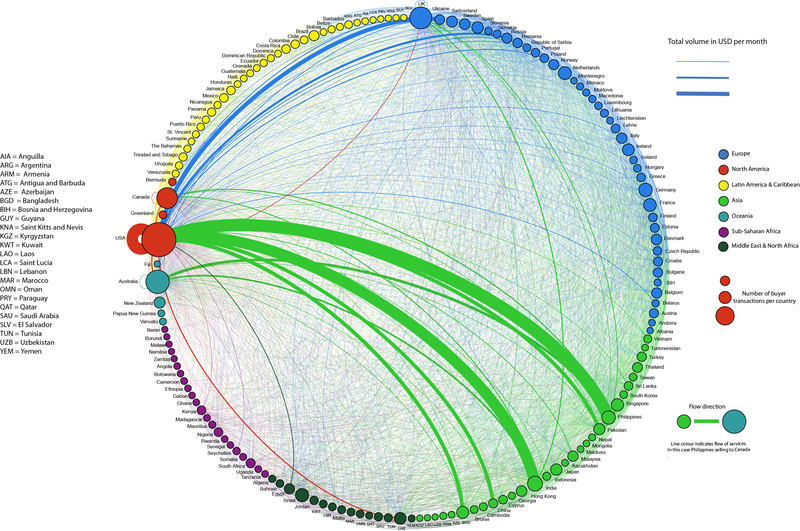 Another very interesting and dense visualization is a connectogram (see our previous post on Connectograms and the Circos tool) demonstrating the highly international trade in the online Gig-Economy: 89% of the trade measured by value happened between a client and a contractor who are in different countries. The network therefore attempts to illustrate the entirety of those international flows in one graph. It depicts countries as nodes (i.e. circles) and volumes of transactions between buyers and sellers in those countries as edges (i.e. the lines connecting countries). Country nodes are shaded according to the world region that they are in and sized according to the number of buyer transactions originating in them. Edges are coloured according to the flow of services: with the line shaded as the colour of the originating/selling region. Edges are also weighted according to the total volume of trade. We see not just a complex many-to-many relationship of international trade, but also the large role that a few geographic relationships take (in particular, India and the Philippines selling to the United States). The report’s central question is whether online gig work has any development potentials at the world’s economic margins. Its motive is to help platform operators to improve their positive impact, to help workers to take action to improve their situations, and to prompt policy makers and stakeholders interested in online gig work to revisit regulation as it applies to workers, clients, and platforms in their respective countries. It is interesting to see these marketplaces evolve, in terms of the international, distributed nature, issues such as taxation, intermediation, opportunities and risks. There are also entirely new forms of social networks forming, based on blockchain powered token systems convertible into crypto-currencies (such as Steem). The core concept here is to eliminate not just geographical distance, but also risks from exchange rate fluctuations and predatory intermediaries. It remains to be seen to what degree this can act as a counterweight to technology-induced increasing inequality. Gartner does not publish the x,y coordinates as they caution against using them directly for interpretation. To approximate the data, I screen-scraped them from images revealed by Google search, which introduces both inaccuracies and the possibility of (my) clerical transcription error. It is unlikely that so many companies deteriorate in their execution in unison. More likely, the formula changed and shifted the evaluation landscape upwards, meaning companies that stayed the same on the previously used factors now slipped downwards. 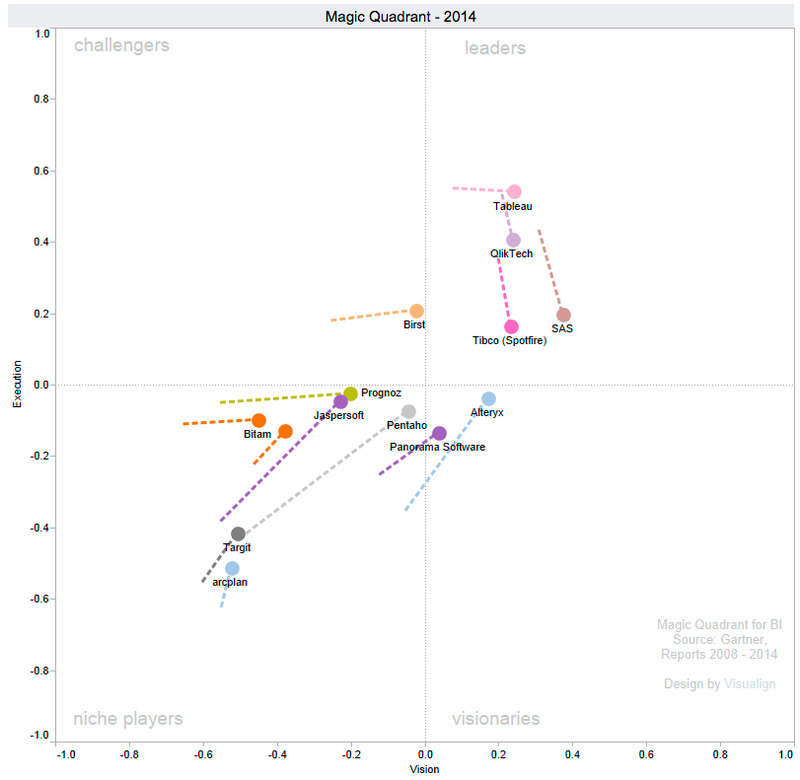 (I read somewhere that Gartner wanted to have only 3 companies in the leader quadrant – an instance of curve-fitting if you will.) Whatever the reason, this shift removed all but three companies from the upper rectangle on execution. That said, relative changes between companies in the same year are still meaningful, as they are all graded on the same formula. From the entire trajectory (left) one can see that all of them have been leaders for many years. 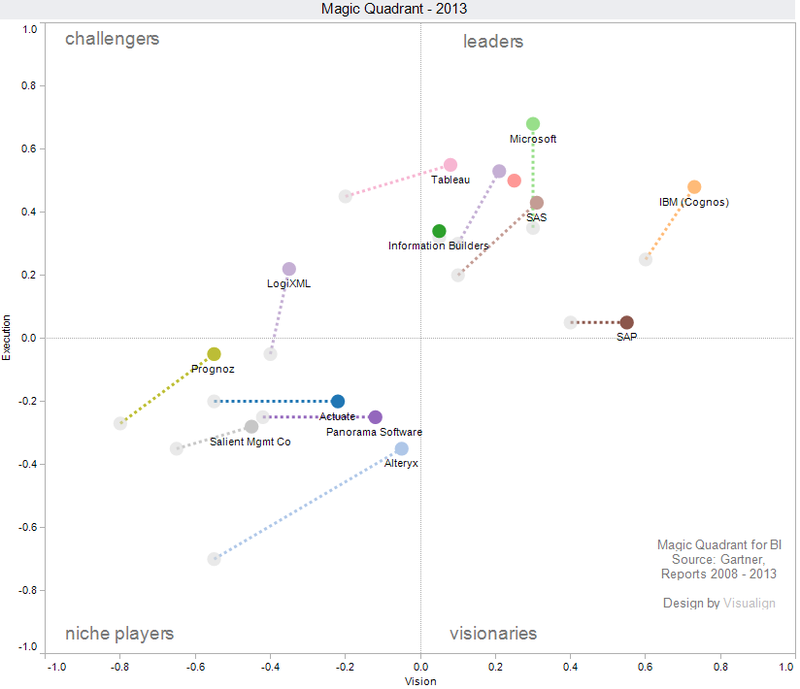 Tableau joined the leader board in Feb-2013 from the status as challenger. It went public in May-2013 (ticker symbol DATA) and has grown into a company with close to $1B in annual revenue and > 3000 employees. It has had particularly consistent ratings on Execution scores since then. Many of the visualization metaphors it has introduced are commoditized by now, with a desktop designer tool for both Windows and Mac, a robust server product as well as a free public cloud-based option. For any company of such size it is a challenge to grow fast enough and it needs to both stay ahead of the competition as well as diversify into adjacent markets. Its stock price reached lofty heights of $127 (roughly $10B market cap) by mid-2015, but saw a drop to ~$80 by year-end 2015 and then cut in half one month later ($41 on Feb-1, 2016), from where it has only modestly recovered to around $52. Most SW products nowadays are offered as a service, which Tableau still hasn’t transitioned to as much as others have. That said, it’s Aug-2016 hiring of Adam Selipsky from Amazon Web Services indicates this transition and focus on Tableau Online and scale. Microsoft is in a unique position for many reasons: It has a very healthy and diverse product portfolio across Windows, Office, Server, Cloud, and others. Most of these help build out a complete BI stack, helping it in the Vision dimension. Furthermore, it can subsidize the development of a large product and offer it free to capture market share. Unlike Tableau, the Power BI price point is near zero, which has helped it acquire a large community of developers, which in turn provides a growing gallery of solutions and plug-in visualization components. Lastly, Power BI is very well integrated with products such as Excel, SharePoint and SQL Server. Many enterprises already invested in the Microsoft stack will find it very easy to leverage the BI functionality. 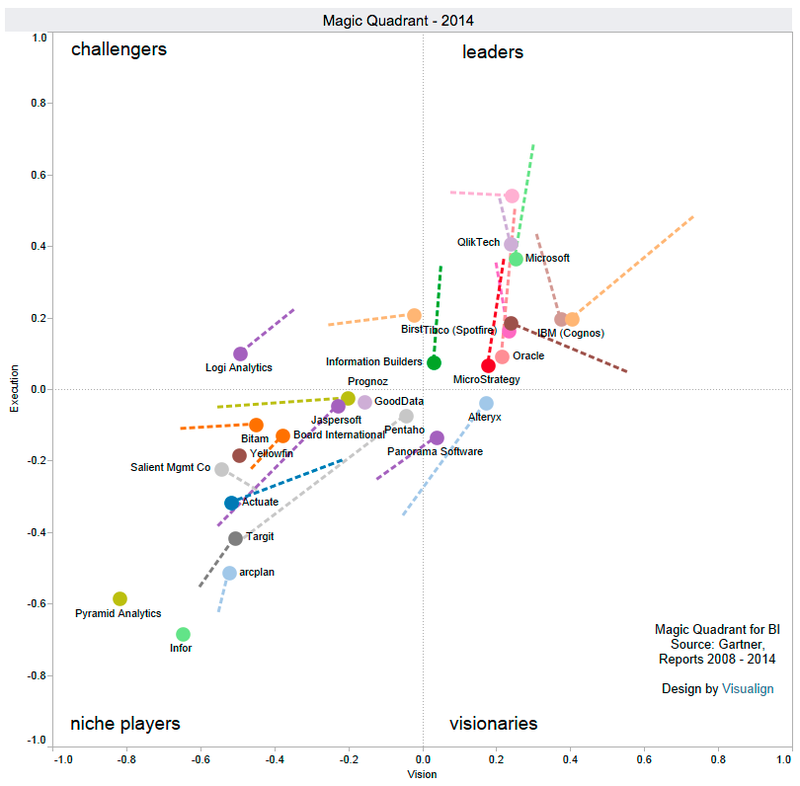 I don’t have personal experience with QlikView, but enjoy reading on Andrei Pandre’s visualization Blog about it. 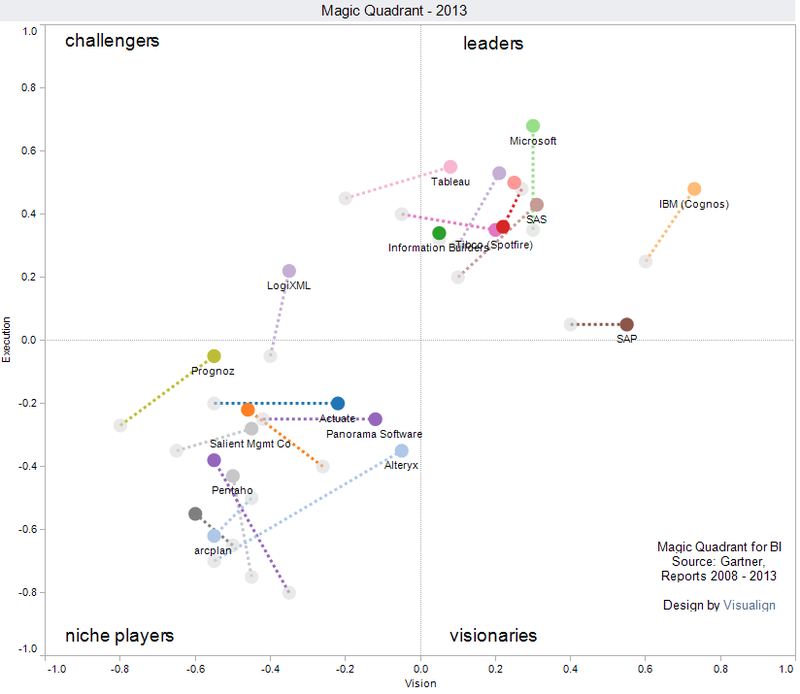 Qlik was always a bit different, focusing on complex analytics more than mainstream tooling, and it having been taken private in Mar-2016 seems to have reduced its leadership status. Another Blog I quite enjoy reading is blog.AtScale.com. (such as the 2017 article on the BI MQ by author Bruno Aziza). 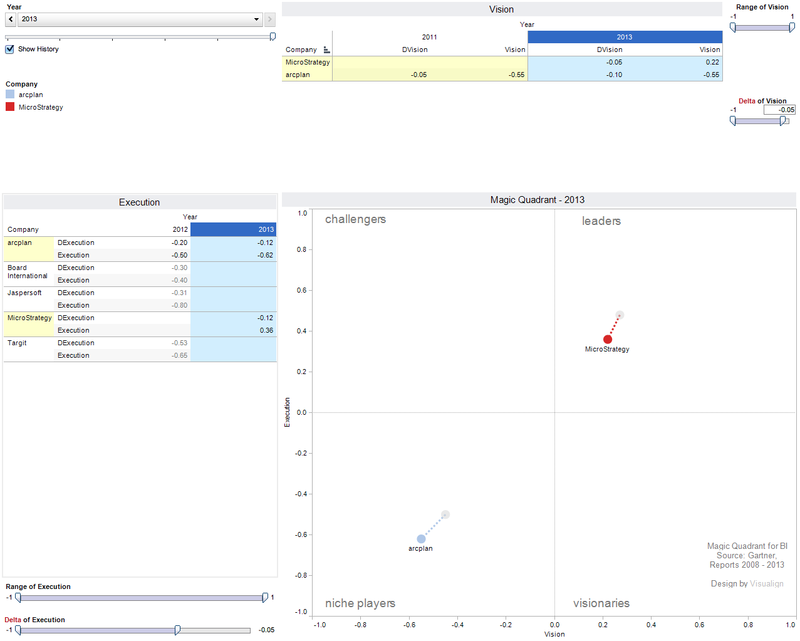 Visualization tools and galleries – BI tools have reached a high level of maturity around the generation of dashboards with interconnected components as well as complex interactive visuals such as treemaps or animated bubble charts. Composing the visual presentation is often the smallest part of a BI project, with proper data-mining often taking an order of magnitude more effort and resources. ETL Commoditization – the need to support data-wrangling as part of the solution, not a mix of add-on tools. 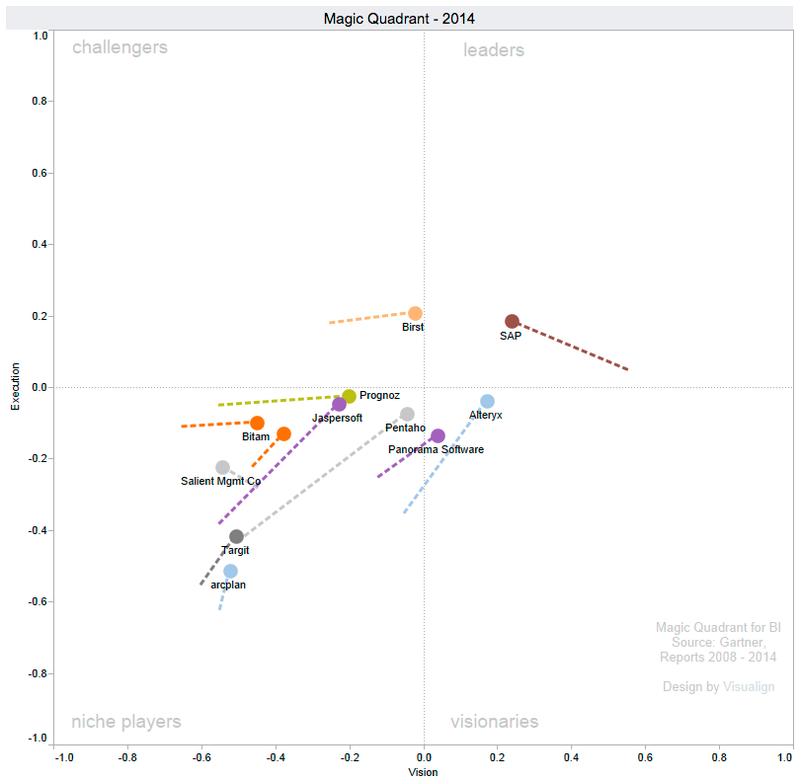 Microsoft’s SSIS, Tableau’s Maestro, Alteryx Designer Tools, etc. Hybrid Cloud and On-Premise solution – Most enterprises want a combination of some (often historically invested) On-Premise data store / analytics capabilities with newer (typically subscription-based) Cloud-based services. Two weeks ago I attended the HIMSS’17 conference in Orlando (HIMSS = Healthcare Information Management System Society). I was particularly interested in the Clinical and Business Intelligence track and exhibitors in that space. My overall impression is that adoption of BI tools in Healthcare is still somewhat limited, with the bigger operational challenges around system interoperability and data exchanges, as well as adoption of digital tools (tablets, portals, Electronic Health Record, etc.) by patients, physicians, and providers. I did see specialty solution providers such as Dimensional Insight. While impressive, their approach seems decidedly old school and traditional. I doubt that any company can sustain a lead in this space by maintaining a focus on their proprietary core technology (such as their Diver platform / data-cube technology). Proper componentization, standard interface support (such as HL7 FHIR) and easy-to-integrate building blocks will win broader practical acceptance than closed-system proprietary approaches. Most sales processes go through a series of stages, from first contact through successive engagement of the potential client to the close. One can think of these as special cases of attrition-based workflows. These are very typical in online (B2C eCommerce) or tele-marketing (call centers) and companies usually collect a lot of data around the conversion rates at each step. How can one visualize such workflows? One metaphor for these processes is that of a sales funnel. A lot of leads feed in on one side, and at each stage fewer pass through to the next. It is then straightforward to want to visualize such funnels, such as shown here by Tableau. What’s the percentage reduction at each step? 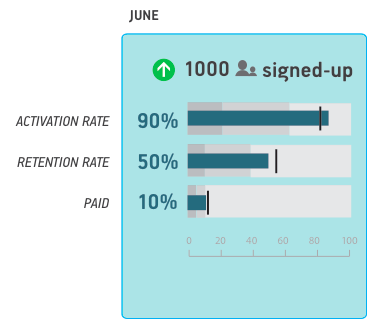 Comparing two or more funnels, which has better conversions at each step? What are the absolute numbers in each step? Are the conversion rates above or below targets at each step? Ash Maurya from Spark59 wrote a very useful article on this topic entitled “Why not the funnel chart?“. In it he looks specifically at comparisons of funnels (current vs. prior time intervals or A|B testing). 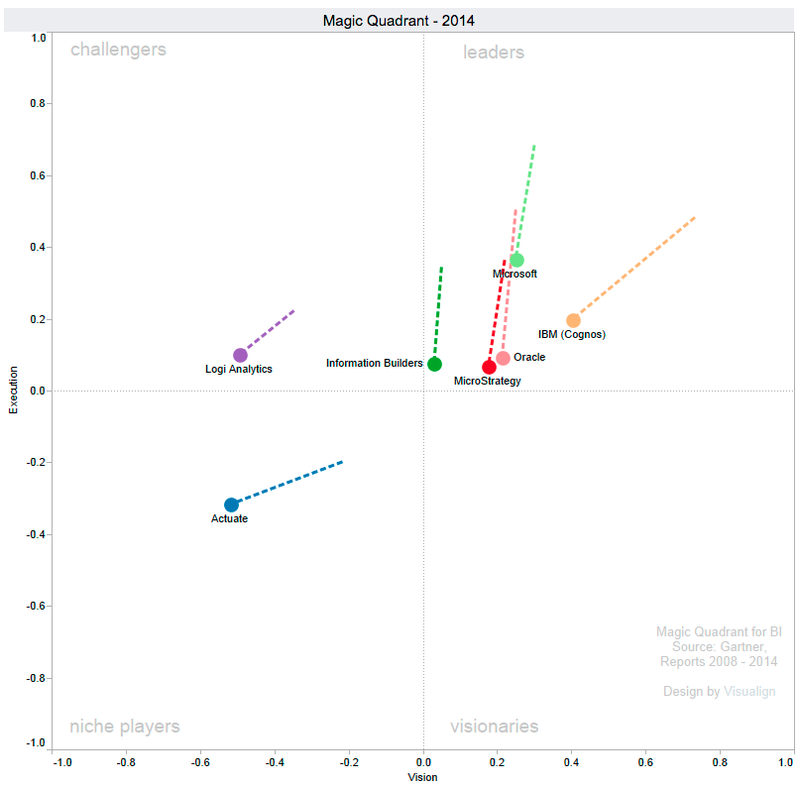 Various authors have looked at how to create such bullet charts in Excel. For example Peltier Tech has looked at this in this article called “How to make horizontal bullet graphs in Excel“. 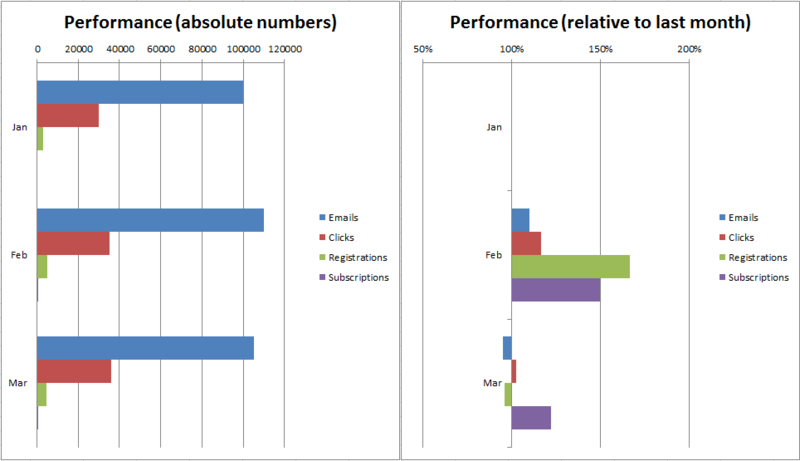 There is still quite some effort involved in creating such charts, as Excel doesn’t directly support bullet charts. Adding color may make sense, although it quickly leads to overuse of color when used in a dashboard (as Stephen Few points out in his preference for grey scales). Another interesting approach comes from Chandoo with an approximation of a bullet graph in cells (as compared to a separate Excel chart object). In this article “Excel Bullet Graphs” he shows how to use conditional formatting and custom formulae to build bullet graphs in a series of cells which can then be included in a table, one chart in each row of the table. It is somewhat surprising that modern data visualization tools do not yet widely support bullet charts out of the box. 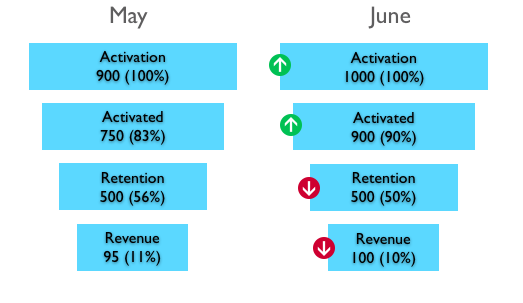 Measuring how marketing efforts influence conversions can be difficult, especially when your customers interact with multiple marketing channels over time before converting. To that end, Google has introduced multi-channel funnels (MCF) in Google Analytics, as well as released an API to report on MCFs. This enables new sets of graphs, which we may cover in a separate post. A year ago we looked at Global Trends 2025, a 2008 report by the National Intelligence Commission. The 120 page document made surprisingly little use of data visualization, given the well-funded and otherwise very detailed report. 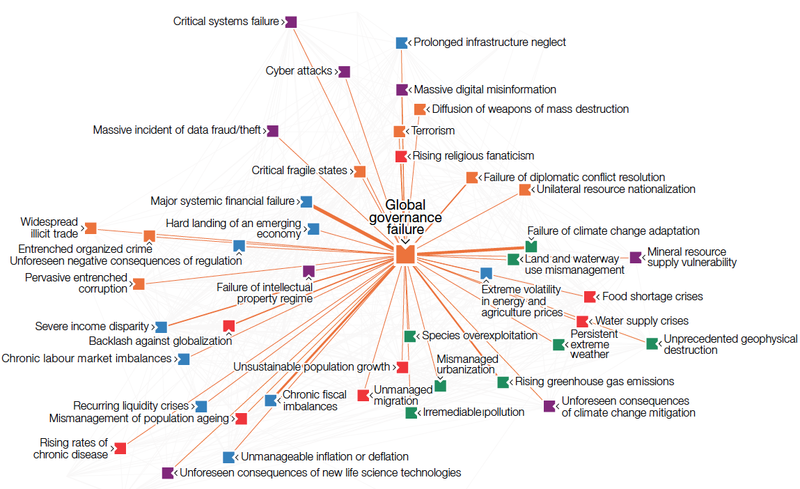 By contrast, at the recent World Economic Forum 2013 in Davos, the Risk Response Network published the eighth edition of its annual Global Risks 2013 report. 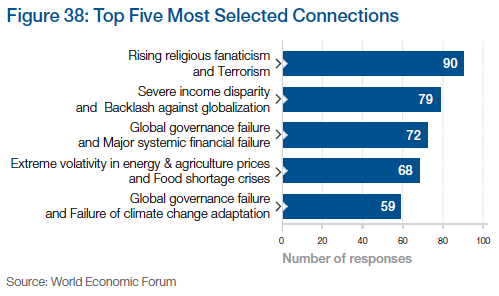 Its focus on national resilience fits well into the “Resilient Dynamism” theme of this year’s WEF Davos. 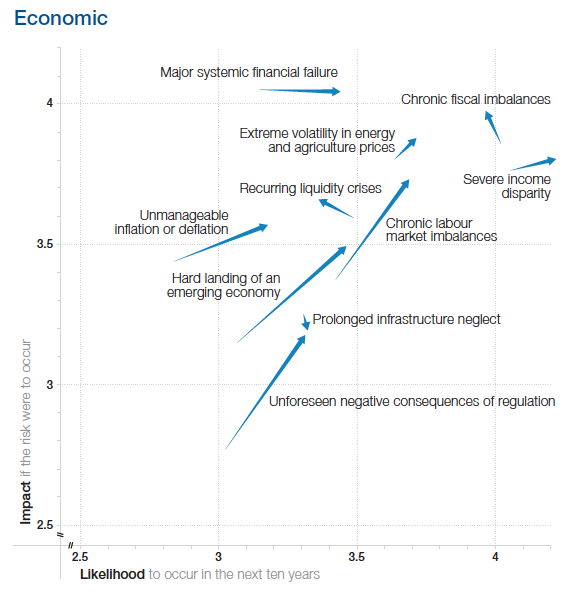 Here is a good 2 min synopsis of the Global Risks 2013 report. We will look at the abundant use of data visualization in this work, which is published in print as an 80-page .pdf file. The report links back to the companion website, which offers lots of additional materials (such as videos) and a much more interactive experience (such as the Data Explorer). The website is a great example of the benefits of modern layout, with annotations, footnotes, references and figures broken out in a second column next to the main text. One of the main ways to understand risks is to quantify it in two dimensions, namely its likelihood and its impact, say on a scale from 1 (min) to 5 (max). Each risk can then be visualized by its position in the square spanned by those two dimensions. Often risk mitigation is prioritized by the product of these two factors. In other words, the further right and/or top a risk, the more important it becomes to prepare for or mitigate it. This work is based on a comprehensive survey of more than 1000 experts worldwide on a range of 50 risks across 5 broad categories. 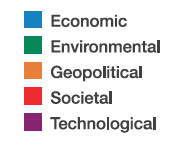 Each of these categories is assigned a color, which is then used consistently throughout the report. 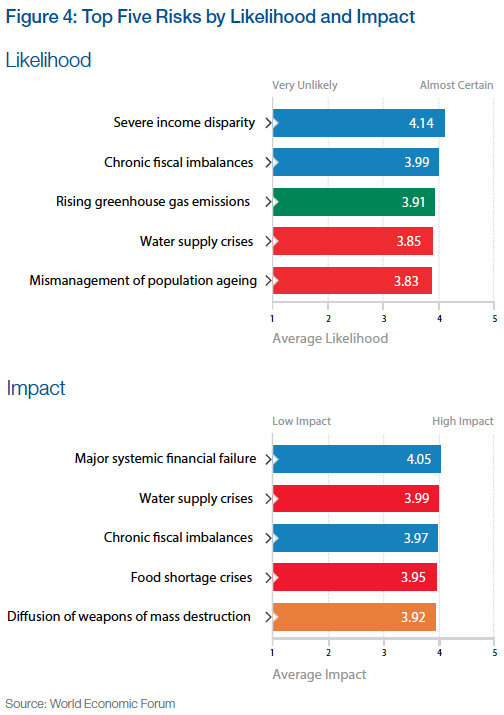 Based on the survey results the report uses some basic visualizations, such as a list of the top 5 risks by likelihood and impact, respectively. This vector field shows at a glance how many and which risks have grown by how much. 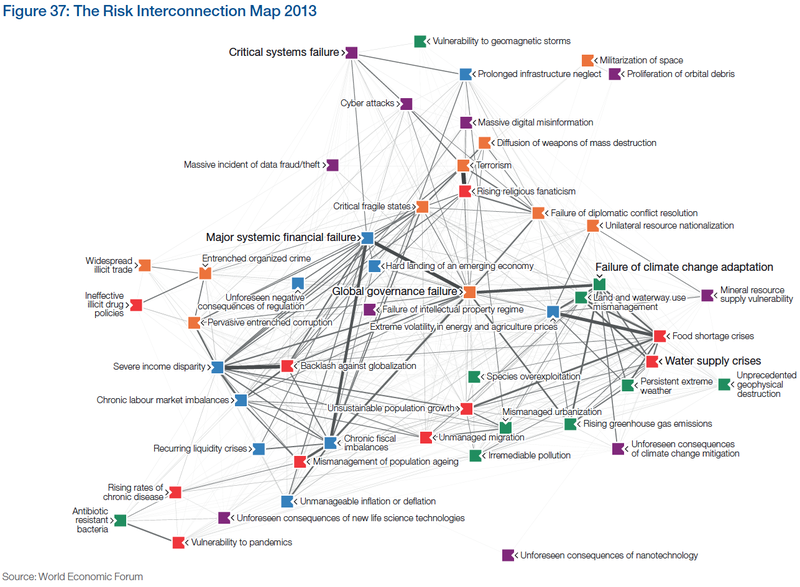 The fact that a majority of the 50 risks show sizable moves to the top right is of course a big concern. Note that the graphic does not show the entire square from 1 through 5, just a sub-section, essentially the top-right quadrant. On a more methodical note, I am not sure whether surveys are a very reliable instrument in identifying the actual risks, probably more the perception of risks. It is quite possible that some unknown risks – such as the unprecedented terrorist attacks in the US on 9/11 – outweigh the ones covered here. That said, the wisdom of crowds tends to be a good instrument at identifying the perception of known risks. 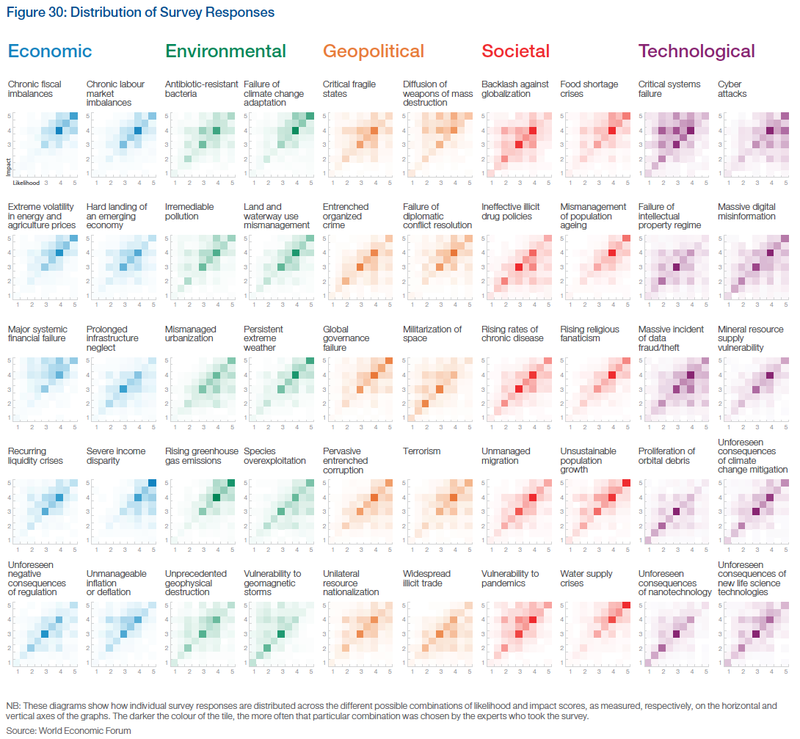 Note the “Severe income disparity” risk near the top-right, related to the phenomenon of economic inequality we have looked at in various posts on this Blog (Inequality and the World Economy or Underestimating Wealth Inequality). This format provides a feel for the dominance of risk categories (frequency of colors, such as impact of blue = economic risks) and for year over year changes (little change 2012 to 2013). The 2011 column on likelihood marks a bit of an outlier with four of five risks being green (= environmental) after four years without any green risk in the Top 5. I suspect that this was the result of the broad global media coverage after the April 2011 earthquake off the coast of Japan, with the resulting tsunami inflicting massive damage and loss of lives as well as the Fukushima nuclear reactor catastrophe. Again, this reinforces my belief that we are looking at perception of risk rather than actual risk. Another aggregate visualization of the risk landscape comes in the form of a matrix of heat-maps indicating the distribution of survey responses. Still it is interesting to observe how for some risks, particularly technological risks such as critical systems failure, the answers are more distributed than for others – chronic fiscal imbalances are a good example. It appears that there is less agreement among experts over the former and stronger consensus over the latter. The report includes many more variations on this theme, such as scatterplots of risk perception by year, gender, age, region of residence etc. Another line of analysis concerns the center of gravity, i.e. 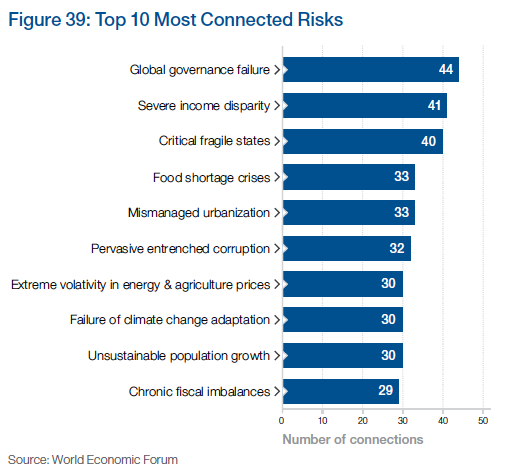 the degree of systemic connectivity between risks within each category, as well as the movement of those centers year over year. Finally, the survey asked respondents to choose pairs of risks which they think are strongly interconnected. They were asked to pick a minimum of three and maximum of ten such connections. 529 different connections were identified by survey respondents out of the theoretical maximum of 1,225 combinations possible. The top selected combinations are shown in Figure 38. 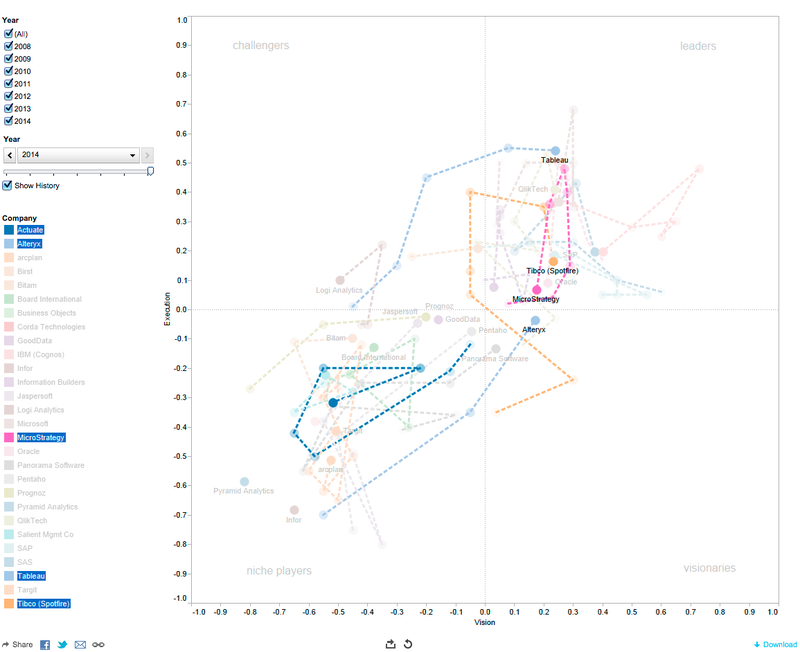 Such fairly complex graphs are more intuitively understood in an interactive format. This is where the online Data Explorer comes in. 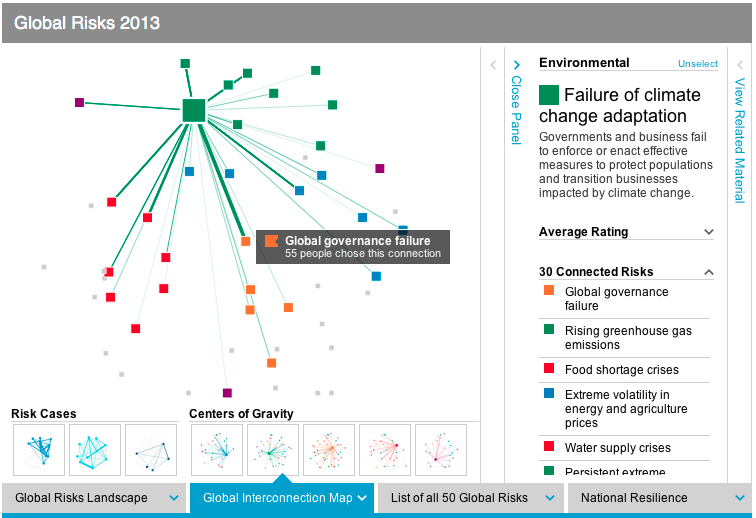 It is a very powerful instrument to better understand the risk landscape, risk interconnections, risk rankings and national resilience analysis. There are panels to filter, the graphs respond to mouse-overs with more detail and there are ample details to explain the ideas behind the graphs. There are many more aspects to this report, including the appendices with survey results, national resilience rankings, three global risk scenarios, five X-factor risks, etc. For our purposes here suffice it to say that the use of advanced data visualizations together with online exploration of the data set is a welcome evolution of such public reports. A decade ago no amount of money could have bought the kind of interactive report and analysis tools which are now available for free. The clarity of the risk landscape picture that’s emerging is exciting, although the landscape itself is rather concerning.